The 25 metre motor yacht Oci Ciornie has been sold with Tim Quinlan at Ocean Independence representing both buyer and seller. Designed by Don Shead, she was built by US yard Palmer Johnson with an aluminium hull and composite superstructure and delivered in 1998. Accommodation is for eight guests in three cabins consisting of a master suite, VIP suite and a twin cabin, all with Sony Bravia LCD televisions, DVD players and en suite shower facilities. The deck layout works very well as the saloon and forward outside spaces are one level. Meanwhile, the interior of the main saloon takes design cues from vintage aircraft design. 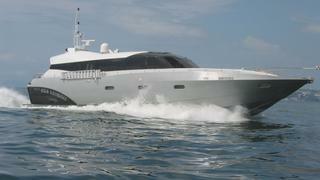 This is a yacht for an owner looking for something very different. The engineering is seldom if ever seen on a private yacht and would appeal to someone who knows and understands out of the ordinary thinking. Oci Ciornie is equipped with a Codag system composed of two MTU diesel engines coupled with two water jets through a reduction gear together with a Lycoming gas turbine. The gas turbine is coupled with a surface propeller through a gear reducer and power is transmitted to an Arneson drive, giving speeds up to 60 knots and making her one of the fastest yachts in the world. Oci Ciornie was asking €249,000.